A new report from the International Federation of Robotics (IFR) suggests that increased automation in the US is leading to job growth rather than job cuts. 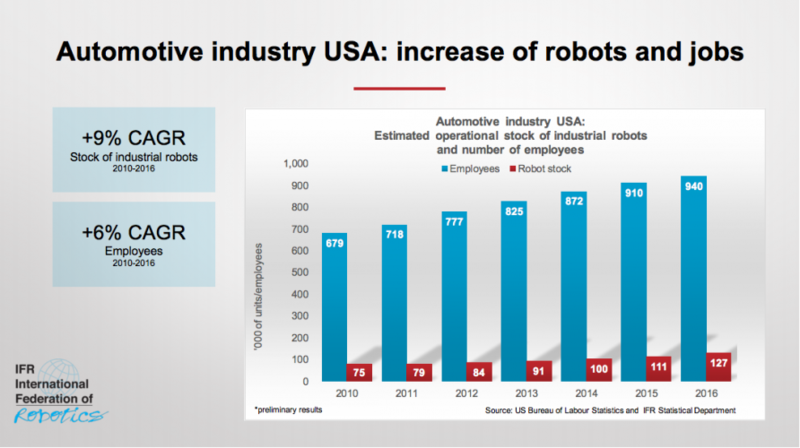 Between 2010 and 2016, the operational stock of industrial robots in the automotive sector increased by about 52,000. According to the US Bureau of Labour Statistics, the number of jobs in the sector rose by 260,600 over the same period. Speaking at the World Robotics IFR CEO Roundtable in Chicago, IFR president Joe Gemma claimed that automation was helping the US to reclaim some of the manufacturing jobs lost overseas in recent decades. “The main driving force of this growth is the ongoing trend to automate production in order to strengthen the competitiveness of American industry globally, to keep manufacturing at home, and in some cases bring back manufacturing that had previously been outsourced to other countries,” he said. While it’s unclear if the increase in jobs has come as a direct result of automation in the car industry, it is not the only sector to have witnessed a positive correlation between the two. According to Jon Battles, Amazon’s director of worldwide engineering advanced technologies, the impending wave of automation that many fear could actually have a positive effect on overall job numbers. Its either make Mc-Jobs available in vast numbers to ‘take-up-the slack’ or have a revolution on the hands of the G&G? That or develop conflicts to soak-up excess numbers?